What have we been up to. The notice board outside has been varnished and cleaned with fresh displays on view. The church gates have been cleaned and painted. The doors to the hall have been painted. New posters in an ‘A’ frame board on display on service or event days. A leaflet for distribution letting the community know who and where we are has been produced. A charity online giving page has been set up with a service scheduled for June being arranged. External welcomers introduced to highlight our presence and to make us more accessible. Notice board in the church hall given a fresh updated look with relevant information on display. Website updated and information regularly added. Regular meeting to discuss further work and outreach. Congregation regularly updated and encouraged to be part of all decisions. The railings at the front of the church have been painted to match the gates. Christian aid week celebrated with service and literature. New blackboards will be on display at the front of the church on the railings to advertise events and additional information to the notice board. Possibly a scripture or two as well. Held East Africa Famine Fund Service on 7th June which was a nice event and raised £200. Mission to Seafarers service to be held on 9th July. Looking into getting a sound system for special services and in the absence of an organist. We have got the Sparklers Nursery graduation that is being held at St. John’s, Annan in June. The church door has had a new coat of paint and now looks attractive and inviting. An amplifier has been purchased to make the music played through media (CDs etc) more audible and easier to use. A tablet has been purchased which links to the speaker and music has been loaded onto it and can be selected when required. Some training will be offered to congregation so that it can be accessed by as many as need it. A charity service will be held on 27th September @ 1830. Details are on the charity events tab. 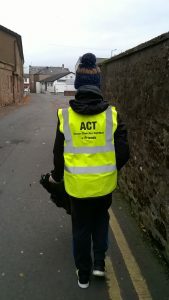 We are hoping to join with other churches in Annan under the ACTS group to litter pick in Annan in order to keep our communities tidy. Further updates will be forthcoming when details are finalised. The Charity Service that was held on the 27th September at St. John’s, Annan was very successful and well attended. The charity that was chosen at random on the evening was Amnesty International and the amount raised was £150, which was an amazing total. Many thanks to all who contributed in any way and attended. A special thank you to those who joined with us from other churches in Annan, it made the event all the more special. 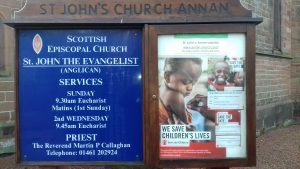 A litter campaign has begun with other churches in Annan (ACT). Hi-Vis tops, litter pickers, gloves, bags and bag rings have been purchased and given out to the churches in a hope that lead by churches, communities may join with us in collecting litter to make our communities a cleaner place and encourage people to stop dropping so much litter. A press launch will happen in November. We are in the process of creating a Facebook page. Please click the link at the top of the home page. This is an ongoing process so bear with us. Facebook page is up and running. Hopefully will continue to grow and spread the good news. Charity service for Save the Children in April is planned. 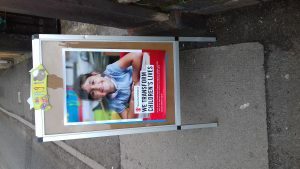 We held two Charitable Services in aid of Save the Children, one at St. Johns in Eastriggs and one in St. Johns Annan. Both were very enjoyable with a total of twenty one in attendance. The amount raised will be posted at a later date once all donations have been totalled. Christian Aid events will be held during May and possibly in June. A member of the congregation is holding a Big Brekkie or family and friends to raise money for Christian Aid and a collection will be held at church.